An entry from one of our poets. If you would like to participate in our annual poster series, put your poetic powers into high gear. 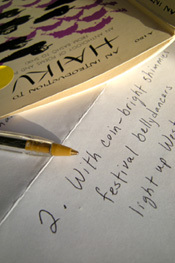 We're soliciting haiku for next year's series now through Sept. 7. To download an entry form, click here. To download our call for haiuku brochure, click here. Or contact us and ask to be put on the mailing list. We mail out entry forms in August. New this year: Our call for artists, previously limited to a class of illustration students at Syracuse University, now goes out to artists throughout the community. Share the news with your artist friends, and have them sign up for our call for art. For your poetic contributions, we welcome haiku about downtown, the city or nearby countryside. Beyond posters, your work stands a chance of being shared with the public in other ways--via cards, booklets, haiku-of-the day features, and large-format flat screens. A note for elementary and secondary school teachers: We enjoy the vision and spirit of student work. But if you have your class participate, please help with the selection work. For each class, send us the best five haiku.